What are the most important components of buying a bike? Well, they aren’t the brakes, that’s for sure. 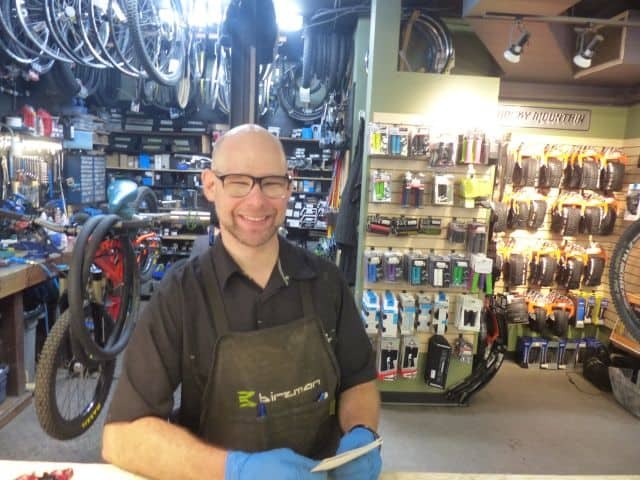 According to Lynn Valley Bikes co-owner Rick Loader, it’s picking the right size. To do that, first you must identify the purpose. What will the bike be used for? Riding to school? Mountain biking? Commuting to work? Located at the junction of Mountain Highway and Lynn Valley Road, Lynn Valley Bikes is the closest shop to the mountains and the North Shore’s vast array of mountain biking trails, so naturally they sell more mountain bikes than other models, but Loader says you shouldn’t buy a mountain bike to ride on the street. Maybe a “hybrid” model with fatter tyres than a street bike but still good on trails and pavement is your best bet. Let trained staff suggest an apprpriate model for your needs, and – whatever you do – don’t buy a bike that your child will “grow into.” Buying a big too big is a recipe for failure. New mountain bike wheels are now 27.5 inches, according to Loader, bigger than the previous standard size of 26 inches. This makes them more stable and slightly faster. If you are commuting on pavement, don’t buy a mountain bike. It’s like driving a truck versus a car. You won’t enjoy the effort you have to put into it. Mountain bikes are for off-road. How important is a helmet? They are essential for all riders. It is illegal to ride without one. While you may get away without one on the North Shore because police are busy elsewhere, Loader reports that Vancouver police are on a crusade against helmet-less riders in Vancouver. The police are parked along bike commuter routes and are handing out tickets like confetti. Fines can be up to $175. Buy a helmet and wear it. As for bike paths on the North Shore, Loader says there seems to be a conflict between the City and the District. The City is doing a good job of creating paths; the District not so much. Often cycle paths suddenly end for no reason. One moment you are on a path, then it disappears. It’s unsafe. Looks like there is a lot of work to do yet to create a bike-friendly atmosphere on the North Shore.